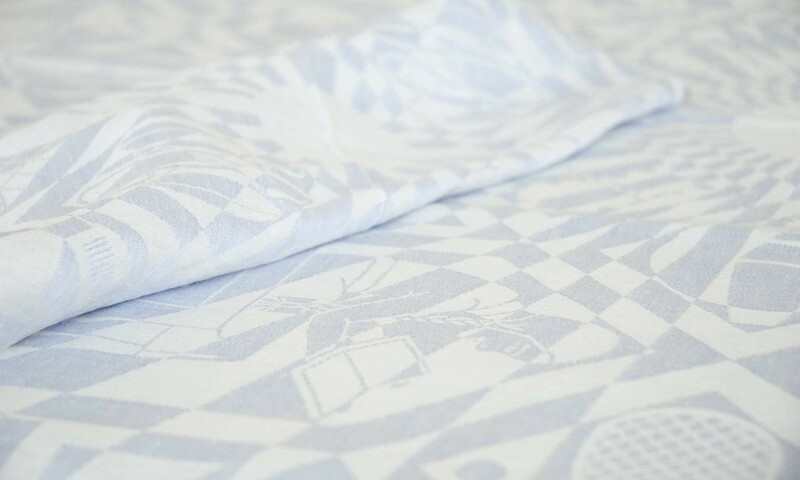 Editors and readers of the magazine Vorsten Royale gave the royal couple two sets of design table linen damask. Princess Máxima chose the designs herself: the modern Grid 2001 by contemporary artist Peter Struycken and the Apple design by Chris Lebeau. The Grid 2001 set consists of a table cloth of 3.60 x 2.75 m with 8 matching napkins for an intimate dinner for a small number of guests. 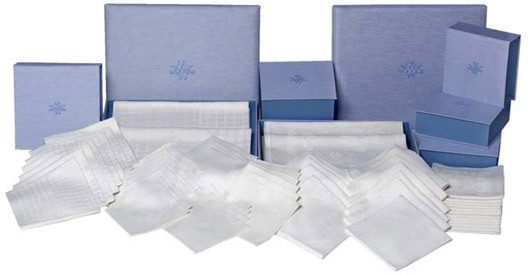 The Apple set consists of a table cloth of 8 x 2.75 m with 24 napkins and 24 small napkins to match. The damask, as well as the luxury gift boxes, were embroidered with the monogram MW which was especially designed for the royal couple. The lady-in-waiting of Princess Máxima, Mrs O.A. Gaarlandt-van Voorst van Beest and the secretary of Prince Willem-Alexander, Mr Th. 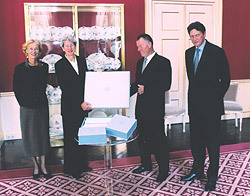 A. van der Werf received the wedding gift for the royal couple at the Noordeinde Palace on 26 September 2002. (photograph (from left to right): Mrs. O. A. Gaarlandt-van Voorst van Beest, Sanny de Zoete, Cor de Horde (editor Vorsten Royale) and Mr. Th. A. van der Werf).